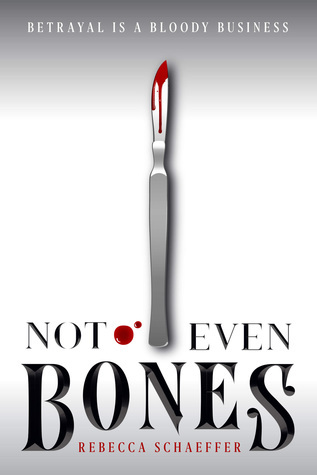 Nita doesn’t murder supernatural beings and sell their body parts on the internet—her mother does that. Nita just dissects the bodies after they’ve been “acquired.” Then her mom brings home a living specimen, and Nita decides she wants out. But there’s a problem: Nita herself is supernatural being and a prime target for the black market if anyone ever found out. When Nita decides to help her mother’s latest victim escape, she ends up taking his place instead. Nita did a good deed, and it cost her everything. Now she needs to escape and make sure no one can ever sell her again. And to do that, there’s no line Nita won’t cross. Well, this book was quite a delight to read. I’m actually not fan of the cover, but I never judge a book by its cover so when the author said Dexter meets Savage Song, I knew I had to read this book and I’m glad that it didn’t disappoint me. I really don’t know what to expect from this book. I knew it was going to be a dark read with some horror elements but damn did it take me by surprise. This book was even more dark, gruesome and bloody than I thought it would be. Seriously, it was even more dark, twisted, and gory than Stalking Jack The Ripper and I loved it. It has a gripping story-line but the best aspect I loved about this book was the morally grey characters. I really enjoyed meeting them and knowing more about them. The world building was okay-ish but I wish the author provided more information. Nonetheless, this book was an enjoyable read filled with monsters, mystery, horror, and lots of gore. The story follows seventeen year old Nita whose mother murders supernatural beings and sells their body parts on the internet. Nita doesn’t like killing but she loves dissecting their bodies for her own research. She dissected different types of unnaturals like zannies who feeds on both emotional and physical pain of others. Nita always had fun dissecting their bodies but she always avoided knowing anything about them before she takes them apart. One day, when Nita’s mom brings home a living specimen, she wants out because dissecting a young boy is taking a step too far. She might work for her mother but she’s not heartless like her. When the specimen reveals his name and pleads for her help, Nita finally helps him escape. As a punishment, she ends up in the black market and gets sold in his place because she’s an unnatural herself who possesses a very rare ability. She’ll be the prime target for the black market if anyone ever found out about her ability. Before her body gets cut out like her fellow unnaturals, Nita plans to escape from her cage even if she had to lose her morals. The main characters in this book aren’t good people but you can’t help loving them. They felt so real. I really liked Nita. She’s a great protagonist and her character was very refreshing to read. She loves dissecting unnatural bodies while listening to Disney songs. Her dream was to attend medical college so that she could research on unnaturals and write theories about them but her mother refused to let her go because she thinks it’s a waste of time and money. She doesn’t live a great life but she finds calm in dissecting corpses. Her weird obsessions sometimes makes her look quite creepy but I can’t help rooting for her. I really enjoyed her character growth. Coming to her mother, I didn’t liked her at all. She was quite cold and heartless when it comes to unnaturalness. She never feels guilty about killing them. I hated her and it looks like she was keeping a lot of secrets. There’s another interesting main character in this book named Kovit who reminded me of August from my Savage Song. He’s a pretty complex guy who captivated me from the start. I hope we get to know more about him in the sequel. There’s no romance in this book but I quite enjoyed every interaction between Kovit and Nita. They’re definitely my favorite parts in this book. The plot was engaging, and interesting throughout! I loved the unique concept besides the fabulous characters. The plot moved in a fast pace and there’s never a dull moment. It had me on the edge of my seat throughout. The whole plot was focused on how Nita tries to escape from the black Market. The action parts were okay but don’t expect much in this book. The plot twist at the end was pretty good, I never saw that coming and I’m pretty excited to know what’s gonna happen next. I liked the writing. The book was written in Nita’s third person pov. The urban fantasy world the author has created seemed very interesting with monsters and all but the author failed to fill in some details that could make us better understand this world so I really hope we get all the info in the next book. I loved the monsters aspect in this book. There are different kinds of monsters with different supernatural abilities in this world like Aurs, Jannies, vampires, chupacabras, pishtacos, unicorns etc. Overall, I immensely enjoyed reading this book! It was a great debut and I can’t wait to meet more kinds of monsters in this world. I hate that I have to wait another year for its sequel, but I’m glad there’s going to be another book in this series because I want more. I highly recommend this book to all the YA readers who loves to read dark fantasy fiction with morally grey characters. This is a very dark read filled with lots of gore so if you can’t handle them then steer away from it. TRIGGERS: Torture, Gore, Blood, death, murder, dissection, cannibalism, mutilation. Wonderful review Raven! I’m glad you really enjoyed this one. Ahaha! She was a bit weird like that but I still liked her character. This book has a lot of gore and some cannibalism. If you can handle them then definitely give it a shot. Okay, disney songs…and dissection???? SOLD. I’m excited for all the different types of characters in this! Glad you liked this one!! Yeah, I know right? It’s weirdly an odd combination 😁 This was an interesting read and I hope you enjoy it if you decide to give it a shot. Ohh, I’ve read the blurb for this one and thought it sounded very interesting, but your review completely sold me! I have to read it soon! Oh my goodness, this book is so not in my comfort level LOL! I am WAY too much of a baby to even touch on some of the things that happened eeks! But I’m so glad you had so much fun reading this book! Sold! I am guilty of judging this book by its cover. You have painted such an amazing picture in my head that I am going to have to give this one a try. I love a great villain story.